“I like a Gershwin tune. How about you?” sang Judy Garland in the 1941 movie, “Babes On Broadway” in which she starred with Mickey Rooney. We have a dozen of her Gershwin tunes for you, all but the first with lyrics by his brother, Ira. When you hear Judy starting to sing Over The Rainbow from the 1939 movie, “The Wizard Of Oz”, you know you are in Harold Arlen country. The film and the song catapulted Judy to stardom. Arlen and his lyricist, Yip Harburg, received an Academy Award for the number which was due to be cut from the movie, but was retained because of the efforts of the producer, Arthur Freed. The song’s title was inspired by Arlen seeing a rainbow over Hollywood. 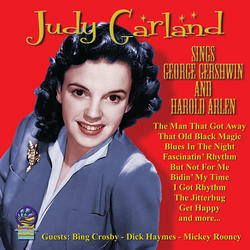 Judy’s record reached No.5 in the charts, the No.1 spot going to Glenn Miller and his Orchestra and vocalist Ray Eberle.